I didn't think it could get any colder down south, but I was wrong. I woke up to 14°F weather and a frozen water pipe. Not cool! I guess we didn't move far enough south. In an effort to think happy thoughts, I am thinking of Valentine's Day. 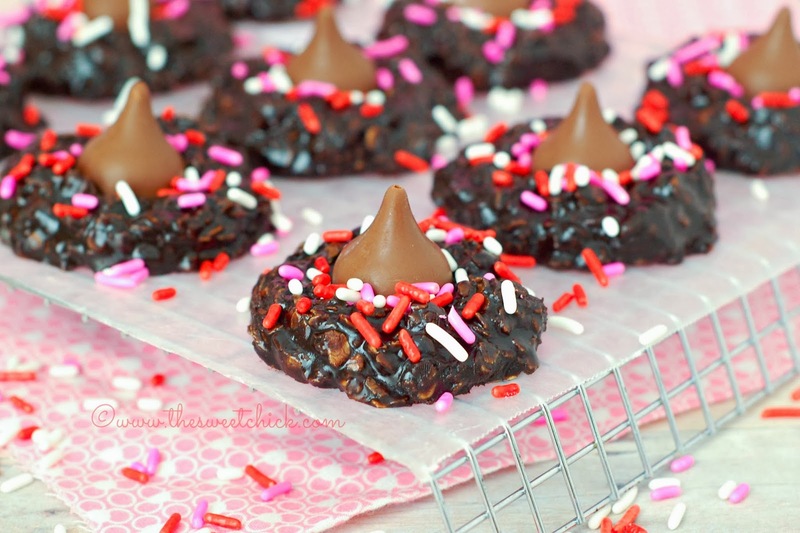 I made some no bake dark chocolate cookies for the occasion with some Cherry Cordial Hershey Kisses I had found during the holiday season. Dark chocolate and cherries are always a good combo in my book. Since my No Bake Mochaccino Cookies were the biggest hit last year, I thought I make them again, but with dark cocoa and dark chocolate spread. World Market sells this decadent dark chocolate spread. If you like dark chocolate, you have got to try it. These cookies just require a little stove-top cooking. Good thing is, you only need one pot. 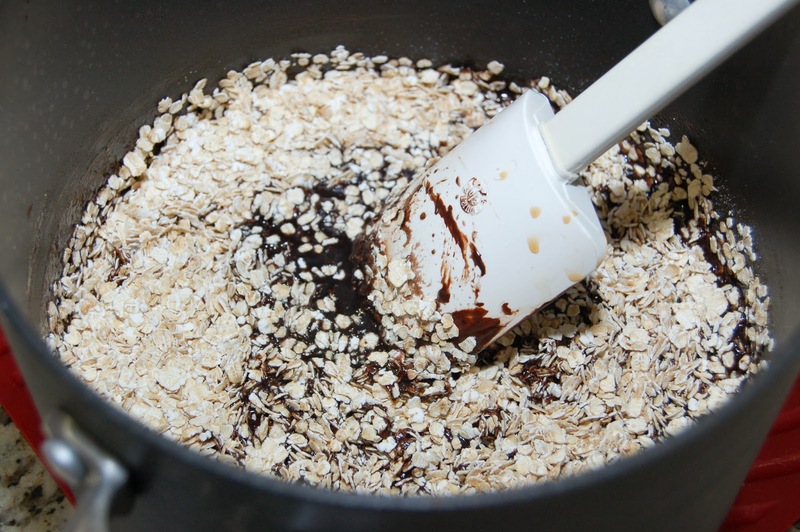 Now it's time to add the chocolate spread and the oats. It's dark chocolate heaven. I did cut the original recipe in half. After all I ate during the holidays, I really didn't need 30 cookies in my house, staring at me. I can deal with 15 cookies much better. 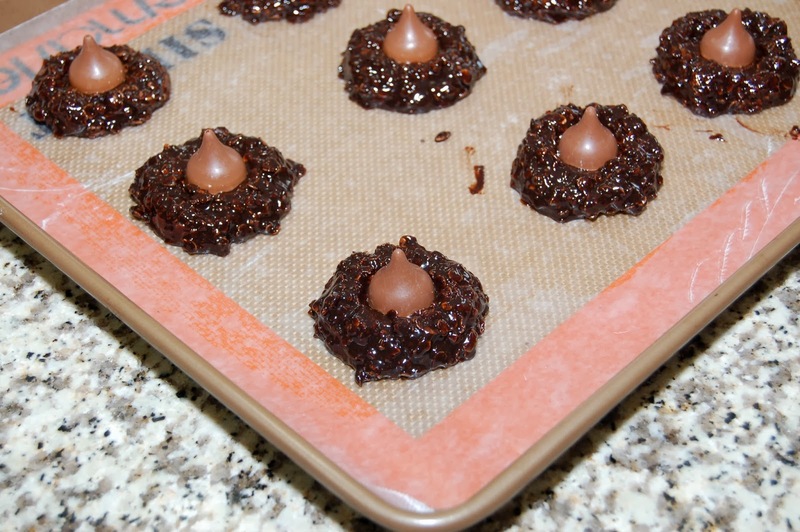 I used a regular cookie scoop to place them on the wax paper, then gently pressed a Hershey Kiss in the center of each cookie. Then I just placed them in the fridge to set. I love the deep dark chocolate taste of these as well as the chewy, gooeyness of them. 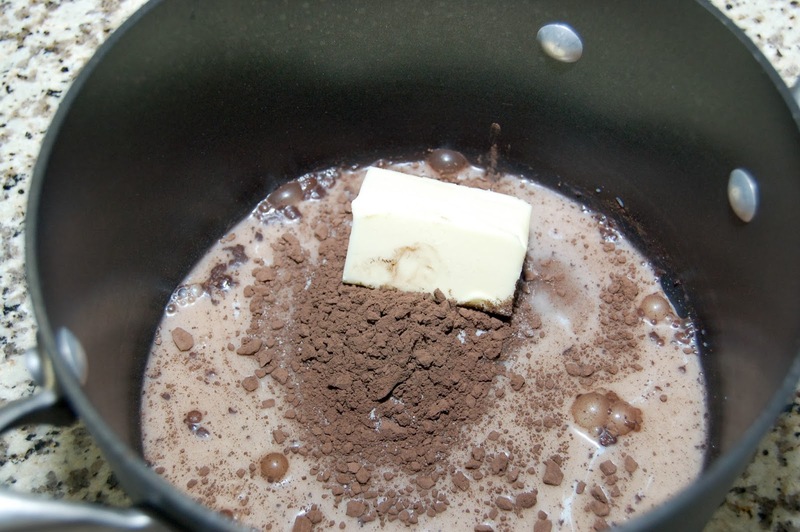 The cherry cordial créme inside the milk chocolate Kisses blends in smoothly with the dark chocolate flavors. I am not a big fan of cherry flavors, but if they are mixed with dark chocolate, I am in. I think I am going to go make myself a hot cocoa to go with these. I hope you guys all stay warm wherever you are. 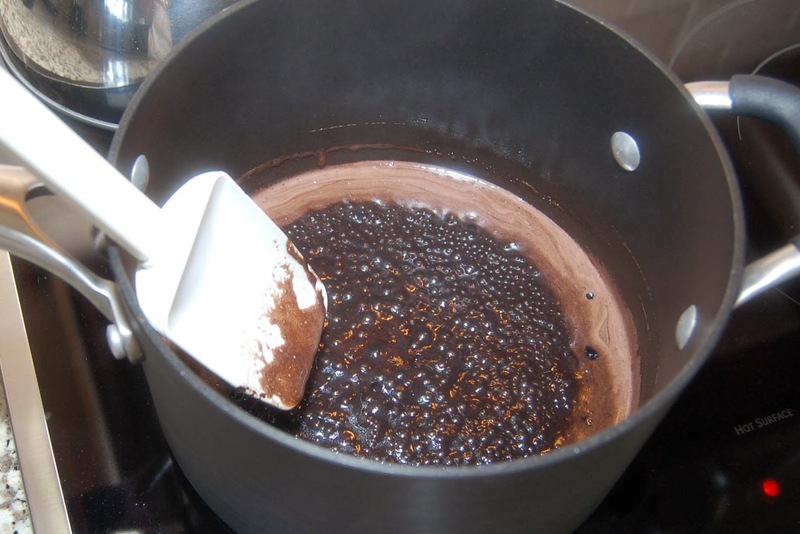 Remove from stove top and add the dark chocolate spread, vanilla and oats. Mix until all incorporated. 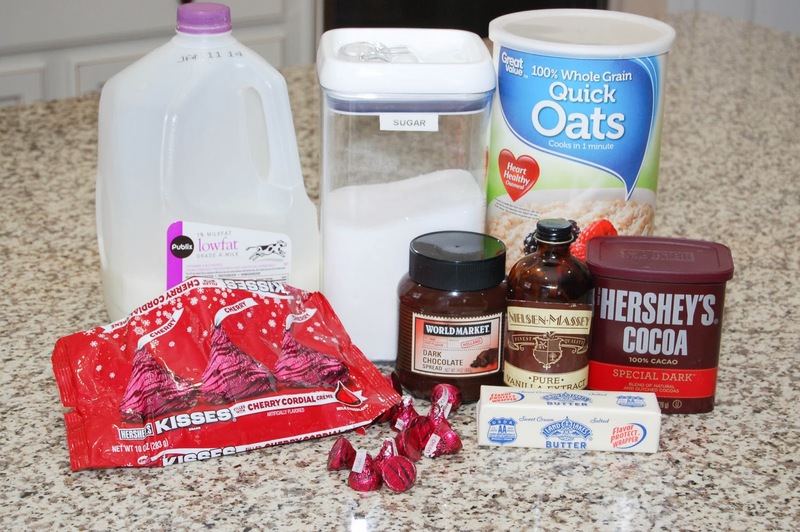 Using a cookie scoop, drop by scoopful onto wax paper and place a Hershey Kiss in the center of each cookie pressing down gently. Place cookies in fridge to set. Grab a glass of milk or a mug of coffee and enjoy! These look so yummy and so cute! 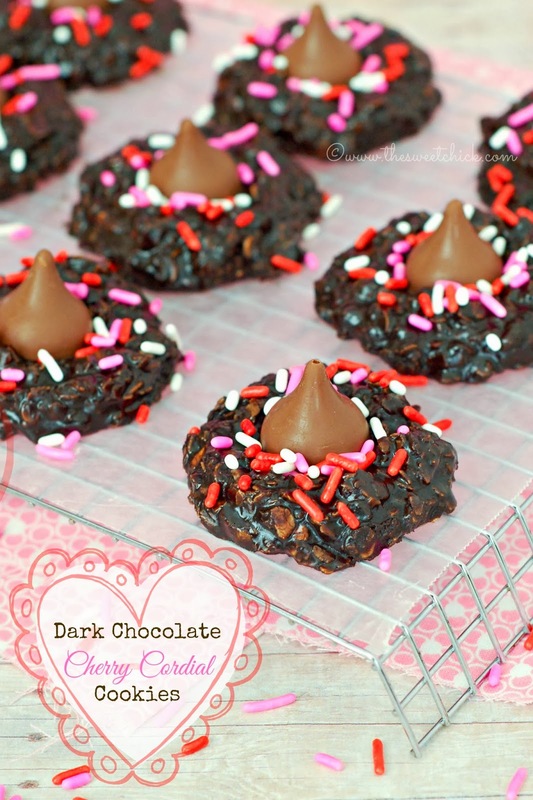 What a great little Valentine's cookie! Really look delicious and easy to make. Right up my alley.